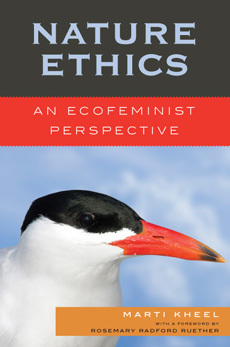 Marti Kheel, Nature Ethics: An Ecofeminist Perspective (Rowman & Littlefield, 2008). Paper ISBN 0-7425-5201-2. To obtain Nature Ethics: An Ecofeminist Perspective please consider ordering from one of your local independent bookstores. You may locate the store nearest to you through IndieBound. You can also order directly from Rowman & Littlefield. To request review copies for journals and magazines contact reviews@rowman.com or send a fax (on company letterhead) to 301-429-5748. For examination copies write to textbooks@rowman.com. For international orders you can purchase from Powell's Books. You can also request that your local library order the book.